Slide-Lok Garage Interiors has installed the best garage floor coatings and garage cabinet systems in homes across the US and Canada since 1987! Available in 3 laminate finishes. Available in stainless steel by special order. If your Slide-Lok Storage Cabinet System includes a countertop, we offer 3 attractive countertop patterns to choose from; Blackstar Granite, Omega Granite and Beige Papas. By special order you can get a stainless steel countertop for a small upcharge. 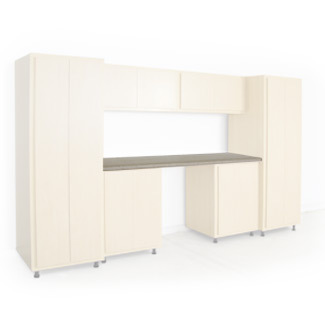 Choose a garage cabinet listed below to view individual Cabinet information and the Interactive Quick Start assembly guides and download instruction sheets. To locate an Authorized Slide-Lok Garage Interiors dealer in your area or to purchase Slide-Lok garage storage systems, please call: 1-800-835-1759 or click the button below to contact us. Note: All product names, logos, and brands are property of their respective owners. All company, product and service names used in this website are for identification purposes only. Use of these names, logos, and brands does not imply endorsement. * Warranty Information: Subject to certain limitations and exclusions. Ask dealer for specific warranty information or click here to read about our warranty.